The Peoples Progressive Party Civic (PPP/C) is bracing itself for more of its top officials to be hauled before the courts in what is being called a campaign by the David Granger administration to not only destroy the reputation of its members but to seek to influence convictions in order to prevent persons from being eligible to be placed on its list of Candidates for the 2020 Regional and General Elections. Ashni Singh and then Executive Director of the National Industrial and Commercial Investments Limited (NICIL), Winston Brassington. Calling the ordeal which played out in the Georgetown Magistrate Courts’ a ‘circus,’ the Opposition Leader said the actions on the part of the administration is expected. “We expect more, this will happen with increasing frequency, I said this to our Members of Parliament long before the elections are held they will do this to a number of other people because they are interested in destroying reputations and they are hoping maybe they can influence somebody to get convictions so that some of our people can’t be part of the list, etc. This is what they are hoping- typical APNU behaviour, typical PNC behaviour,” Jagdeo said. Other PPP parliamentarians, who have been charged with several offences, include Dr. Jennifer Westford, Nigel Dharamlall, and Dharamkumar Seeraj. 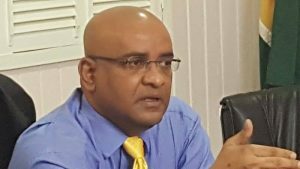 According to Jagdeo, the coalition government since in opposition had telegraphed its move. The actions he said, was to save face with the coalition constituents in light of the growing list of corruption scandals and failed manifesto promises. He said too the actions on the part of government will inherently transmit a negative signal to potential investors. “I am thinking about a businessman who might want to invest in this country looking at what is going on today,” and accused government of subverting agencies with political directions and pointed to the Special Organised Crime Unit and the Office of the Director of Public Prosecution.